In Reiner Knizia’s classic game, players take turns placing hexagonal tiles from their hand onto a map of Japan where some of the hexes (villages, towns and cities) contain one or more of the 3 types of markers (helmets, rice fields, buddhas). 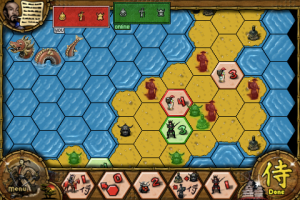 When a location containing one or more markers is surrounded by tiles (sea areas don’t need to contain tiles), the tile strengths of each player are added up and the player with the greatest relevant strength wins the relevant marker. 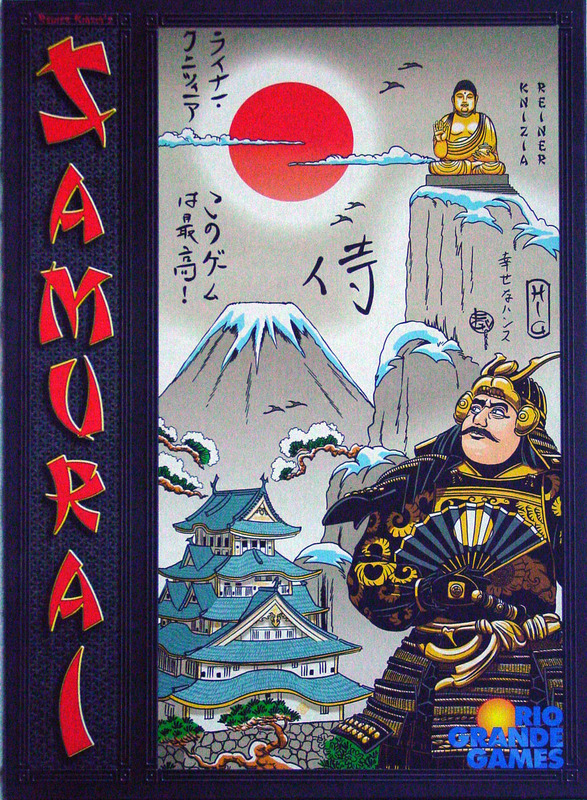 Many tiles’ strength only counts towards capturing one of the 3 types of markers but a few (like the Samurai) count towards all types. For example, a hex on the coast containing a Buddha maker has the following tiles around it: Red 2 buddha, Red 2 samurai, Yellow 4 helmet, Yellow 1 Samurai, Green 3 buddha. As the other hex around this location is a sea hex, the village is surrounded. In this case, Red wins the Buddha because they have a total of 4 towards capturing buddhas. Green’s total of 3 isn’t enough, and neither is Yellow’s total of 1 because their helmet tiles doesn’t count towards capturing buddhas.